Live Well Lake County: Facilitated by the Lake County Health Department, this group prioritizes community issues, encourages collaboration with multiple, diverse stakeholders and takes action to improve overall health and wellbeing of Lake County residents; site includes local data helpful to organizations in the county. Eat Well Action Team: Representatives from county organizations working to empower those who live, work, and play in Lake County to have access, resources, skills, and knowledge to eat healthy by cultivating strong collaborations and aligning community efforts. Heartland Alliance Poverty Report: “Cycle of Risk: The Intersection of Poverty, Violence, and Trauma,” a report on Illinois poverty that includes county-level data helpful for research, grant proposals, etc. USDA Know Your Farmer, Know Your Food Compass: Tool that shows data on farmers markets and food hubs as well as federal investments in local food across the country. USDA Food Desert Locator: Presents an overview of food access indicators and food access data for census tracts across the country. USDA Urban Ag Toolkit: A tool to help entrepreneurs and community leaders successfully create jobs and increase access to healthy food through urban agriculture. Seven Generations Ahead: Serves as the state lead organization for farm to school in Illinois. SGA supports schools and districts with innovative farm to school programming, tools, and resources. USDA Farm to School Planning Toolkit: A guide through questions to consider and helpful resources to reference when starting or growing a farm to school program. University of Illinois Extension School Garden Resources: Research driven information and helpful links for school gardens. Local Food Procurement, USDA Food and Nutrition Service: Information and resources to help schools find and procure local food. Team Nutrition, USDA Food and Nutrition Service: Provides training and technical assistance for foodservice, nutrition education for children and their caregivers, and school and community support for healthy eating and physical activity. Dietary Guidelines and Tools, Office of Disease Prevention and Health Promotion: Provides tools, resources, and key messages of current dietary guidelines. University of Illinois Extension Community Garden Toolkit: A resource for planning, enhancing, and sustaining community garden projects. American Community Gardening Association: Resources and support for those organizing a community garden as well as a map of community gardens across the country. Let’s Move Community Garden Checklist: A step-by-step guide that offers important information about how to safely grow your own fruits and vegetables with others in your community. Northern Illinois Food Bank: Provides support, capacity building, and resources to food pantry agency partners in its 13-county region. University of Illinois Extension, Lake County SNAP-Ed: Provides food pantry assessments, nutrition education, tools, resources for local pantries, and much more. Local Government Food Policy Database: A searchable collection of local public policies that explicitly support community food systems; created by Growing Food Connections. 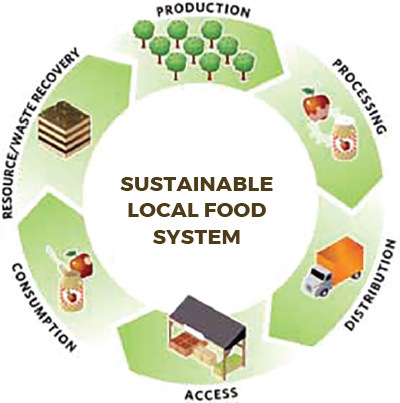 CMAP’s Municipal Strategies to Support Local Food Systems: A guide to including local food in comprehensive plans and an urban agriculture ordinance toolkit. Breaking Ground, A Guide to Growing Land Access for Local Food Farming in Northeast Illinois: Created by Openlands and the Liberty Prairie Foundation; a comprehensive guide for local food farmers and private and public landowners to help them navigate challenging land access issues. Guide to Illinois Laws Governing Direct Farm Marketing: An Illinois Stewardship Alliance publication that includes information on federal, state, and local laws regarding public health and food safety. Illinois Direct Farm Business Guide: University of Illinois Extension publication that contains information about the Community Supported Agriculture (CSA) model, tools, resources, and templates for farmers. 2018 Cottage Food Guide: An Illinois Stewardship Alliance guide that describes what the law does and does not allow and what you have to do to qualify as a cottage food operation. Criteria for Selling Meat, Poultry and Eggs at Farmers Markets : An Illinois Department of Agriculture guide that specifies regulations producers must follow if selling meat and eggs at farmers markets. Food Safety Information for Producers: University of Illinois Extension research-based information and resources that assist individuals and organizations in understanding and preventing injury and illness while working in Illinois agriculture. Building Successful Food Hubs: A business planning guide for aggregating and processing local food in Illinois created by Illinois Department of Commerce and Economic Opportunity, University of Illinois Business Innovation Services, Illinois Department of Agriculture, and FamilyFarmed.org. USDA Food Hub Directory: Lists businesses or organizations that actively manage the aggregation, distribution, and marketing of source-identified food products to multiple buyers from multiple producers. Liberty Prairie Foundation's Farm Business Development Center: A beginning farmer incubator program that provides farmers with affordable access to land, equipment, and infrastructure as they start their business. Angelic Organics Learning Center: Supports and serves prospective, beginning, and experienced farmers through training in business planning, financial management, and regenerative agricultural practices. Illinois Specialty Growers Association: A group focused on the promotion and development of the Illinois specialty crop industry. Illinois Specialty Crops, Agritourism, and Organic Conference and Trade Show: Conference that features a wide variety of break out sessions and topic tracts, workshops, a trade show, and much more; typically held in January in Springfield. FamilyFarmed Good Food Festival and EXPO: The Expo connects industry farm and food produces with trade buyers, wholesalers, retailers, and investors; also includes informative panels and presentations. The Festival follows the next day and is an annual public celebration of good food with chef demonstrations, vendors, educational presentations, and more; typically held in March in Chicago. CMAP’s Lake County Local Food Brochure provides an overview of the state of Lake County’s food system, the economic potential of local food, a summary of local government support of local food, and more. The Live Well Lake County website has valuable and compelling county and community-level data for nonprofit organizations writing grants or researching target communities, or for interested residents.